Some 150 dinner guests at the Sectech dinner banquette in Copenhagen on the 19th of November witnessed the prize ceremony when the winners of the prestigious Detektor International Awards 2008 were announced. The eleven awarded products were chosen on basis of both innovation and customer orientation. Winning products need to be smart as well as useful. Henrik Otterstedt, Bosch Security Systems, Lars Hansson, Axis Communications and Michael Szücs, iLoq. This was the 9th annual Detektor International Award prize ceremony, this time held at the Scandic Copenhagen centrally located in the Danish capital. Scandic Copenhagen was also the location for the two day Sectech expo, focused as always on security technology, where around 50 companies exhibited. Lennart Alexandrie, CEO for AR Media, the publishing company behind Detektor magazine and several other security industry related magazines and web sites, was the master of ceremony. The criteria to be nominated for a Detektor International Award encompasses not only the technical solution but also the packaging and over all presentation of the product, which actually might just as well be a service. The Detektor International Awards should be viewed as a focus on continual technical development, but just as importantly they should encompass the continual progress of demands for more sophisticated packaging qualities, where the presentation of the whole concept becomes increasingly more of a priority to successfully reach the customer, Lennart Alexandrie said. Finnish innovators iLoq was selected as the winner of the Best Access Control Product Award. The product iLoq S10 is an electronic self-powered locking solution with flexible system management options. The Highly Commended Product Award in the Access Control category went to TAB Systems' Diadem Smarti biometric reader. The RKL55 reader from HID and the RF30EM reader from Siemens Building Technologies Security Products were both awarded as Innovative Achievements. "We created a solution based on customer needs and demands, and I feel that we are on the right track," said Michael Szücs, director sales & marketing, iLoq Ltd, when receiving the best product award at Sectech in Copenhagen. The Hemi-Directional Loudspeaker from Bosch was awarded with the prize for Best Alarm and Detection Product. Through its innovative design, the hemispherical speaker can cover large areas for example in warehouses and exhibition halls. The Highly Commended Product Award in the Alarm and Detection category went to Thruvision for their T5000 electromagnetic camera. The Galaxy Dimension alarm and access control from Honeywell was awarded as Innovative Achievement. This category only had three nominees. "It is nice to see that the 11 percent of our turnover we spend on research and development each year pays off," said Henrik Otterstedt, Nordic manager, for Bosch Security Systems. The glass sculpture for Best CCTV Product Award was handed over to Axis Communications for the Axis P3301 network camera, a fixed dome that includes the Artpec-3 chip to create enhanced image processing and support for H.264 compression. The Highly Commended Product Award in the CCTV category went to Bosch for their Bosch IVA 3.5 intelligent video system. The Q22 hemispheric network camera from Mobotix and the NSR-1000 Series network surveillance server from Sony were both awarded as innovative Achievements. "It is an honour to receive this award on behalf of Axis. I want to thank our engineers, they have been working very hard with the ARTPEC-3 chip for a very long time, " said Lars Hansson, key account manager Nordics, Axis. The three first prize winners of the Best Product Awards are very unlike each other, not the least regarding company size. Bosch Security Systems has about 10,000 employees and had a turnover of 1,391 million Euro in 2007 (the Bosch group has about 270 000 employees). Axis has about 500 employees and a 2007 turnover of about 170 million Euro. The iLoq company, working together with a network of partners and with the production outsourced, has only ten employees. Axis and Bosch are well established in their respective fields. Axis is generally regarded as a leader within network cameras, according to IMS Research figures, a market share of close to 50 percent in the EMEA region. One significant factor to having reached this position is of course innovation. Bosch Security Systems is one of the big global manufacturers of security products, with a broad offering containing everything from CCTV systems to personal alarm solutions. iLoq, a real niche player in this context, has this year received a lot of attention regarding the S10 locking system. Where will iLoq be a year from now? The Detektor International Award is the only global security industry award which cannot be applied for. The selection is based solely on product launches which have taken place in the last twelve months. The selection of products is carried out by an international jury comprising of eleven independent security industry professionals. These facts make the Detektor International Award both unique and very prestigious. 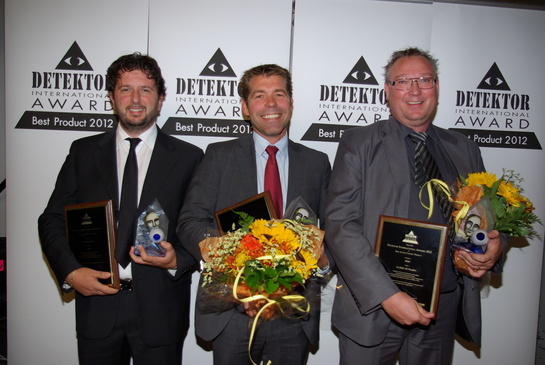 The next Detektor International Award will be presented at Sectech in Stockholm in October 2009.